Abstract: Primary pancreatic lymphoma (PPL) is an extremely rare disease, with only a few cases reported in the literature. Clinical manifestations of PPL are often nonspecific and may mimic other pancreatic diseases. Because of the limited experience of PPL, clinicopathological features, differential diagnosis, optimal therapy, and outcomes are not well defined. We described two cases diagnosed as PPL and confirmed by histological examination and immunohistochemical analysis. Case 1 was a young man with obstructive jaundice and upper abdominal malaise mimicking a pancreatic adenocarcinoma. A computed tomography (CT) scan revealed a diffuse heterogeneous mass in the head of the pancreas along with dilated bile ducts, no dilated pancreatic duct, no liver or splenic involvement, or evident retroperitoneal adenopathies. The patient underwent a pancreatico-duodenectomy, and the postoperative histopathology confirmed diffuse large B-cell non-Hodgkin lymphoma. Postoperatively, he received six courses of the CHOP regimen (cyclophosphamide, doxorubicin, vincristine, and prednisolone). Case 2 was an older man with left flank pain. A CT confirmed a mass with irregular margins at the tail of the pancreas and the hilum of the spleen. 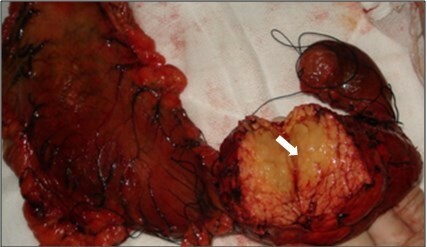 The mass was heterogeneous, with no clear boundary between lesions, spleen, stomach, and pancreas, with nearby blood vessels wrapped around it, and multiple enlarged lymph nodes in the abdominal cavity. A CT-guided biopsy was performed. The immunohistological findings of the specimen revealed a diffuse large B-cell lymphoma. The size of the tumor was significantly reduced after four cycles of the CHOP chemotherapy regimen. These two cases were different in clinical manifestation, location, and treatment. We reviewed the literature and discussed the clinicopathological features, differential diagnosis, optimal therapy, and outcomes of this neoplasm.